← A food blogger event…. I had no idea!! Trying as many recipes as I can! When my sister comes to visit from Boston she’s been bringing us some recipe booklets that she’s found at her local Whole Paycheck (or officially known as Whole Foods). They’re awesome and the last one she brought out for my mom, other sister and I contained so many recipes that looked amazing. With the exception of a couple that involved shrimp…I don’t like shrimp. Now they might have this at my W.F. but I haven’t been able to find it. You can probably go the site for Cooks Illustrated and order them, but I’m enjoying the fun gifts from my sister. I started by making a couple dishes one night when a few friends were gathered for some yummy wine and food. I had a grand plan of 2 apps and 1 entree, but after the first 2 apps we were stuffed! Started with the stromboli recipe. I had never made it but it couldn’t have been easier. 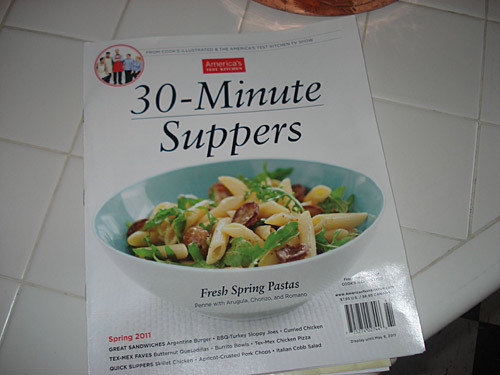 I will say that most of these recipes do take longer than 30 minutes, realistically. I should say something right now about the way I cook; I don’t measure very often. I use the ingredients that are called for, but I might use a bit more or a bit less of something depending on my level of love (or lack of) for it. Take a bag of pizza dough from W.F. (or wherever), and quarter it. Take one of the quarters and roll it out. 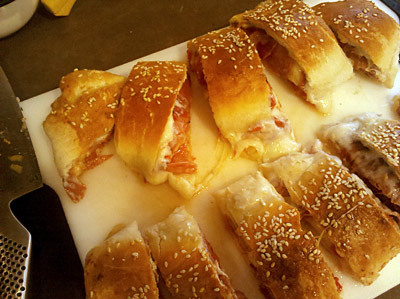 Layer some provolone, dry salami, capo, jarred red peppers and top with a layer of parm. Roll it up and brush a beaten egg over the dough. Last, sprinkle with sesame seeds. Throw it on a baking sheet lined with parchment paper and bake it 375 for around 25 mins…until it’s golden like the picture. Let it sit for a moment and then slice it up and pass. melted cheese and cured meat in a perfectly baked crust - is there anything better? The instructions called for marinara sauce for dipping, but it honestly didn’t need it. So I left it out. For the second app I made the chicken tortilla pizza. This was actually done in under 30 mins. Cook up some black refried beans with some chopped cilantro. Spread this over the tortilla leaving a little boarder on the edges. Shred some chicken and layer that next over the beans. Sprinkle some chopped pickled jalapenos on top. Bake at 350 on a greased cookie sheet for about 12 minutes until cheese melts. As that is cooking, mix some sour cream with a little lemon zest, some fresh lemon juice, S&P and some more chopped cilantro. 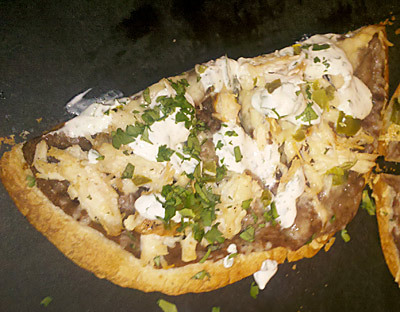 Dollop some of the sour cream mix over the pizza and a little extra cilantro, slice and serve! I didn’t get my camera out soon enough and it was 1/2 gone in about 2 seconds. Hope this picture gets you the idea. Since we were all full from those 2 dishes, my friend Jen and I decided to save the Greek meatballs w/lemon orzo for the next night. 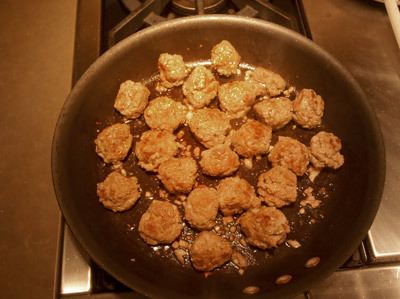 Now, this recipe claimed it took 3 minutes for the meatballs to cook… lies. It took about 8 at least. First step is getting the fresh bread crumbs. 2 slices of high quality white bread (I used a sourdough loaf and removed the crust), rip into small pieces and smash it up with a fork until almost a bread crumb texture. In a larger bowl, take about 1 1/2lbs ground beef and mix with about 1/2 C plain Greek yogurt, chopped white onion, S&P and your smashed bread crumbs. Last, roll them into rounds about 1 1/2 inch in diameter. Heat up some canola oil and cook in batches. As those are cooking make the orzo. I think we just made a cup of dry orzo and that was fine for 2 and had some leftovers. This recipe for sure makes WAY more meatballs than orzo to match, so keep that in mind. Toss your cooked orzo with some OO, lemon zest, some fresh lemon juice, chopped fresh oregano and S&P. 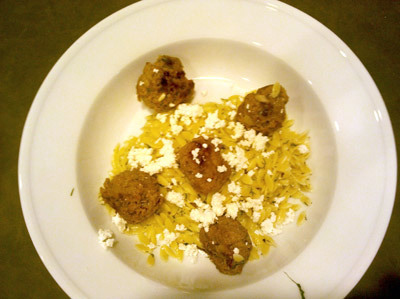 Pile on a few ‘balls over the orzo and sprinkle with fresh feta. This picture didn’t do this dish justice. This and the stromboli are my favs so far. 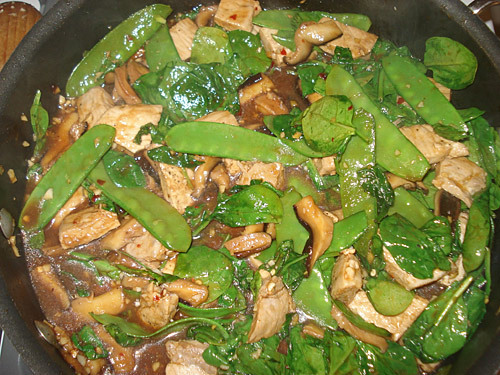 Last I made the spicy pork stir fry with snow peas, spinach and mushrooms. Heat some oil in a large pan and cook the mushrooms until tender. This recipe called for a pork tenderloin, but I didn’t have it. I had some sliced pork in the freezer, so I just cooked those up quickly, but made sure they were medium rare since the pork would cook more once added to the stir fry. Add some chopped garlic, ginger, 1/4 C. of hoisin sauce and about a C. of chicken broth and a splash of soy sauce. Cook the sauce down a little. When all is cooked nicely, add a couple cups of fresh baby spinach and when wilted, serve over some brown rice (or whatever rice you want). So, I’m going to keep going through this recipe book and I’ll let you know what else comes out of it. Happy cooking! 2 Responses to Trying as many recipes as I can! You don’t like shrimp?! I had no idea. 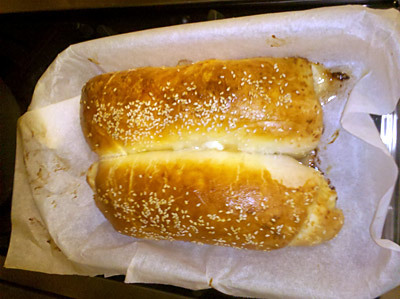 Your stromboli looks fantastic.